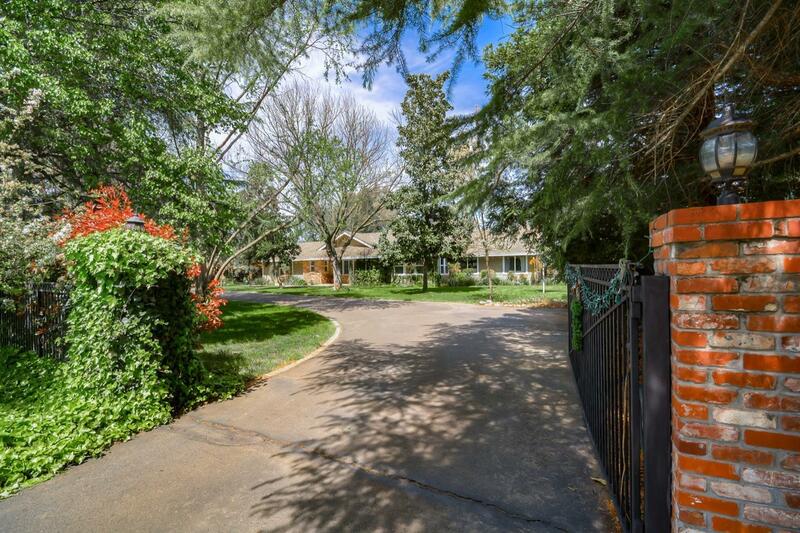 Desirable single story home on over two acres with a private gated entry! It offers country living with easy access to shopping and amenities! The updated interior features granite in the kitchen and bathrooms, soft close cabinets, wood flooring, newer paint throughout and a large kitchen and great room concept with high ceilings. It boasts a spacious bonus room with a built-in Murphy bed for guests, hang out for entertaining, or theater room. Theater equipment stays! Sit back and relax in the sparking salt water pool offering an in-pool lounge chair platform and spa with fountains while enjoying the beautiful mature trees and fenced pasture area for horses. This property has fruit trees, detached shed/shop, RV/boat parking and solar is OWNED! On a scale from 1-10 this gorgeous, well-manicured property is an 11!